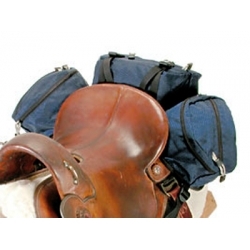 Urban Horse Promotes a Deluxe Stowaway Saddle Pack by Easycare - Designed to fit most Western, English and Endurance style saddles, this is the roomiest of the Stowaway saddle bags. The main centre pouch is very spacious and easy to access without items falling out. Each side pouches can hold extra water bottles or spare hoof boots. The pack attaches via two adjustable straps that can be threaded through the rear saddle d rings with additional side straps attaching to the girth or stirrup leathers creating a secure no-bounce fit. Manufactured from ripstop nylon with waterproof urethane backing with soft seams and short pile fleece backing on inside face of bag to protect both horse and saddle.